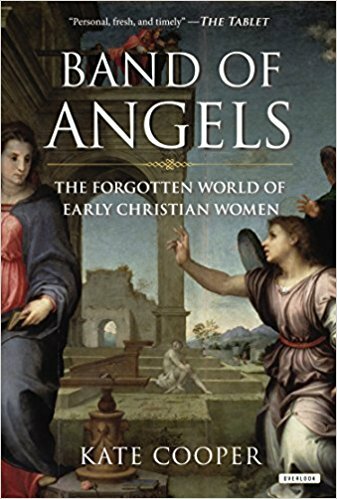 Band of Angels is a well-researched narrative history of the women around Jesus and within the rapidly growing Christian community in its first five centuries. The author, Dr. Kate Cooper, is professor of ancient history at the University of Manchester in England. Dr. Cooper holds degrees from Princeton, Harvard, and Wesleyan universities. She is also a Rome Prize winner and a fellow of the American Academy in Rome. Dr. Cooper writes of her experience as a parent and how it led her "to bring out aspects of a story that seem to speak to a given situation (p.xv)." Her scholarship is apparent throughout the book which examines the lives of women who shared in the rapid expansion of the gospel within the first five hundred years of the Christian Church. Evidence of her painstaking inquiry into the role of women within the ancient Near East and the Mediterranean world is very apparent. Her treatment of the gospel of Luke and the Acts of the Apostles is unique in and of itself. She discerns considerable "emotional realism" within Luke-Acts. Of special interest within the gospel of Luke are the stories of: Mary's visit to her cousin Elizabeth, the widow of Nain who lost her only son, the woman who washed Jesus' feet with her tears and wiped them with her hair, Jairus' daughter whose life was restored, and the woman who touched Jesus' cloak as he went to the home of Jairus. What is most interesting is how Cooper looks at the life and ministry of Jesus through the eyes of the women. Dr. Cooper also explores later first, second, and third century records—sometimes referred to as the apocryphal New Testament—and considers the later Christian writings about Perpetua, Constantine's mother, Helena the poetess, Proba, Olympias, and Eudoxia. Cooper uses the writings of Eusebius of Caesarea, Dio Cassius, Sozomen, Tertullian, Justin Martyr, Athanasius, and Gregory Nazianzus. The bibliographical source materials comprises the last twenty pages of the book, and indicates that she made use of the John Rylands Library's holdings of Greek Papyri. Of the documents explored, she considers the apocryphal works of limited value as far as factuality goes, but insightful as to the impact of following Jesus for families and siblings in the first two centuries and especially on the female side—daughters, mothers, or sisters— thereby verifying Jesus' statement of the cost of discipleship. Cooper felt the writings of the apostolic, the ante-Nicene, and the post-Nicene fathers had considerable value and particularly so in the cases of both Emmelia, mother of Basil the Great, Gregory, bishop of Nyssa, and Macrina, their sister. The work of both Basil and Gregory bore the fruit of a larger family project founded within the family's home—a project which affected not only Asia Minor but which also spread throughout northern Africa and northward as far as Ireland. The author's point was that "the enthusiastic participation of the women was one of the driving forces" (p.164) in the spread of the Christian faith. Unique to Band of Angels is Cooper's attention to how individual women appear with respect to character, sentiment, and social standing. Luke especially notes that after the crucifixion, it is women who visit the empty tomb and it is women who are told "He is risen." Throughout the book, Cooper gives character analyses of the women of the first five centuries. It is this reviewer's intention to tease the potential reader to "pick up" and read this unique work, which not only identifies the parts or roles women played in the spread of the gospel, but also the problems which confronted them during the institutionalizing of the Christian community between the second and sixth centuries.